Western yoga appropriates Indian culture to turn a profit. Coming from India, I don’t understand a lot of things about the Western world, including the Kardashian obsession, the fact that there’s a drink called “chai tea” (which in Hindi literally translates to “tea tea”), the way things are spelled, and especially, the unabashed commercialization of yoga. Yoga and its relationship with the West have been constant sources of bemusement to me and Indians all over the world. Back home, yoga isn’t a fitness regimen or a fashion trend; it’s a way of life that’s seamlessly integrated into our daily routines. I’ve practiced yoga since I was a child, as have my parents, siblings, and friends. Growing up, we never saw it as a remarkable, life-changing activity. We were fully aware that doing yoga doesn’t guarantee washboard abs and bulging biceps; the myth of the yoga body never existed for us. The Instagram-perfect pictures of beautiful women twisted into pretzel-like contortions constitute a glamorous, glitzy version of yoga that is far from reality. Let’s start with a few basics. What is yoga, really? Patanjali, an Indian sage, is believed to have written the Yoga Sutra 2000 years ago. The Yoga Sutra mapped out the processes that ultimately lead to spiritual liberation or enlightenment. It’s a mental, spiritual, and physical discipline that transcends the asanas (the physical aspect of yoga) that the Western world is so enamored with. Yoga in its purest form also involves breath work, restraint, meditation, and concentration. It is a practice deeply rooted in religion, particularly Hinduism, and for many it is an expression of faith. Yoga’s essence lies in immersing the body in a state of peace and well-being. Clearly, yoga isn’t just a form of exercise; it’s a philosophy. It’s a way of being. Conveniently selecting specific physical postures, saying a few Sanskrit words for added authenticity, and wearing fitted (transparent?) exercise pants isn’t yoga—it’s cultural appropriation. But yoga isn’t just exercise for the Western world, either. It’s also a billion-dollar industry. Advertisements of scantily clad women posing in those omnipresent yoga pants, glowing with divine light, have infiltrated print and social media. Yoga classes have never been more popular, and workout gear is flying off shelves. A video of Briohny Smyth doing some mind blowing yoga in her underwear went viral, and yes, her skills are impressive, but why is she in her underwear in the first place? Is it because yoga has to be sexier to appeal to the masses? As I watched the video, I thought of my yoga instructor back home: a short, squat, mustachioed man who doesn’t earn half of what Smyth does. I think of Indian gurus, usually acutely religious men, practicing in loose loin cloths—they’d never buy yoga pants. So why does the Western world so devoutly worship yoga and its practitioners? Is it just shrewd commercialization? Or is it a way to connect to something “exotic”? Many people believe they are preserving a time-honored tradition, imbibing India’s rich and varied culture, but they are blissfully unaware of what that culture actually constitutes. 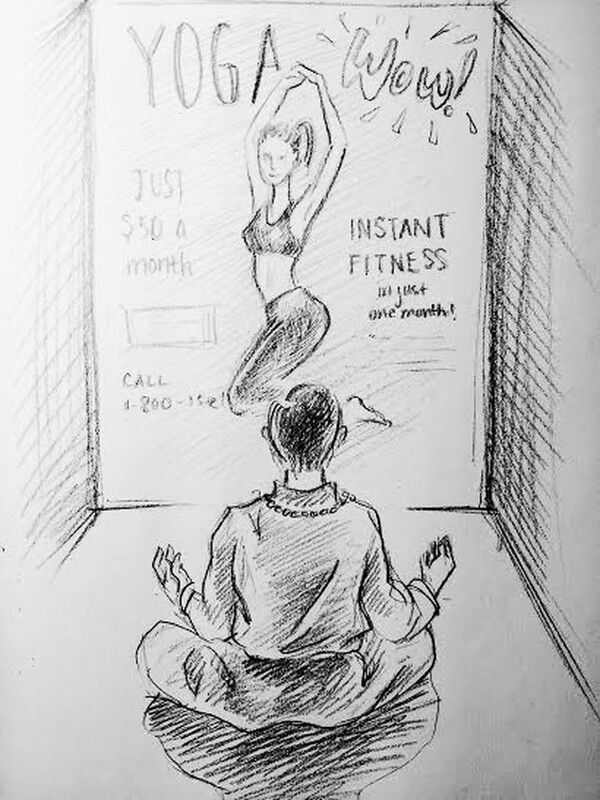 Western yoga turns an ancient Indian tradition into a business—and this is a classic example of imperialism in the modern world (déjà vu, anyone?). This confluence of the East and West has me wondering, is this some sort of fusion yoga? Is it okay to repackage yoga and sell it out? Is it okay to let people wrongly believe they’re genuinely participating in Indian culture? For better or worse, the East still factors in Western judgments on what’s “in” and what’s not. It is true that yoga’s popularity surge has gotten more Indians to take an active interest in the discipline. Perhaps yoga is India’s gift to the rest of the world, but it’s a gift that deserves to be respected. To me, yoga is only a minuscule piece of a larger picture: the romanticizing of India, its culture, and its people. Home, to me, is violent, heady, noisy, and boisterous. Its familiar chaos is order to me, as are its pungent smells and vicious traffic. I don’t think of India as a spiritual getaway to uncover the meaning of life. India is a simmering, bubbling, smelly pot. It’s changing and evolving, and new problems float to the surface everyday. Socially, economically, and politically, it has a long way to go. Just like yoga, there’s a lot more to it than meets the eye. India is not a shortcut to the West’s yearning for spirituality and connection. I’m all for practicing yoga universally—as long as people respect its historical and cultural significance and don’t turn it into an unrecognizable and insignificant fitness fad.